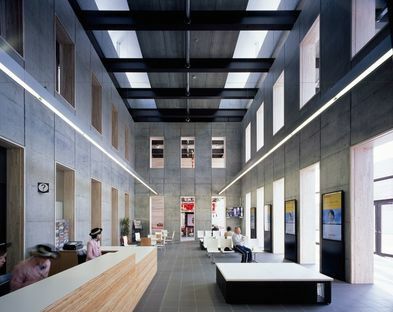 ORUPARK Multipurpose Center stands on the site of an an early twentieth-century railway station in Tsuruga, Japan. Chiba Manabu Architects have preserved the original station layout in the new ORUPARK, a multipurpose park open to the city of Tsuruga. 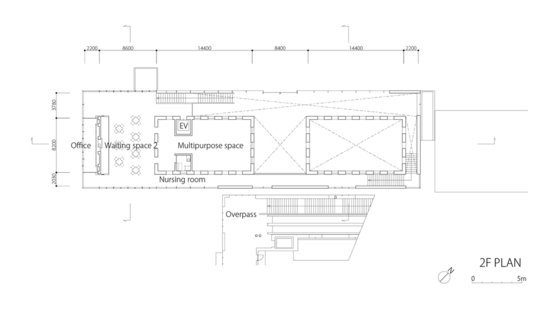 The municipality of Tsuruga commissioned Japanese studio Chiba Manabu Architects to design ORUPARK Multipurpose Centre, a multipurpose public facility next to the city’s railway station. 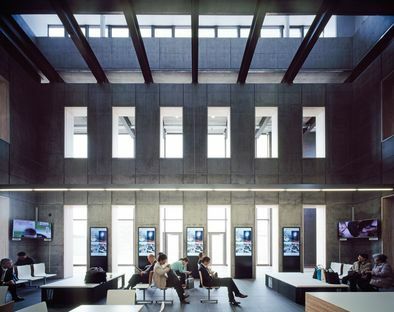 Designed in 2009 and opened in 2014, ORUPARK Multipurpose Centre is part of a redevelopment plan for the station neighbourhood involving construction of public spaces for the use of residents and visitors alike. Chiba Manabu Architects’ ORUPARK stands between the railway tracks and the new Station Plaza, with which it forms a service centre due to be completed by the end of 2015. The architects of Chiba Manabu could not ignore the heritage of the building that used to stand on the site, an an early twentieth-century railway station: a rarity in the centre of a city in Japan, where there is little interest in building conservation, the station has become well-known and popular with the people of Tsuruga. According to archive photos, the old building was a timber-frame complex with two wings joined by a passageway with a gabled roof, an expression of a long-lost form of vernacular architecture. 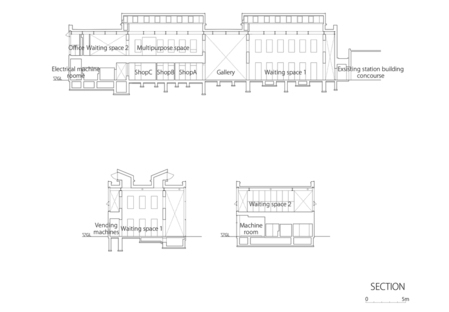 This compositional layout, and the rhythm created on the facade by the tall, regular windows, guided the design of the new ORUPARK which has now risen out of the ashes of the old station. 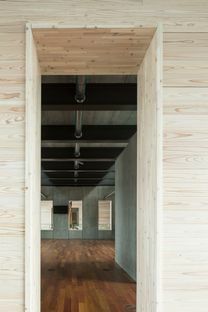 Behind a single volume with a big strip window we may glimpse a heart of wooden boards, made up of two symmetrical blocks arranged around a central gallery. 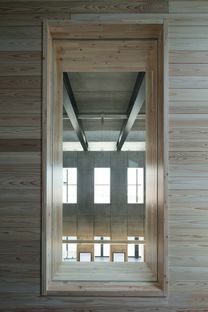 The two floor-to-ceiling blocks reflect the rhythm of the windows legible in the walls of the old station building, extending the openings over two levels to create doors as well, thus ensuring plenty of communication between spaces. 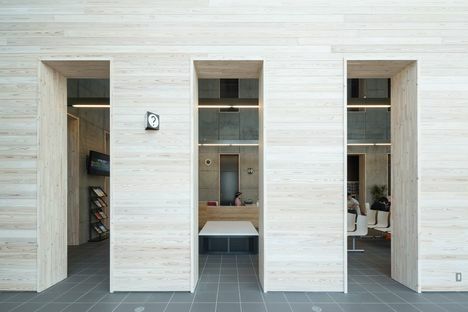 Underlined in the new building, this rhythm is however interpreted here as an alternation of solid and hollow volumes, reinterpreting the blocks of wood not as closed spaces but as spatial confines. 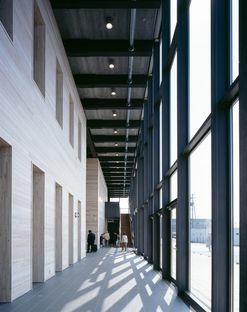 The same principle applies to the frames of the external windows, the grid of which establishes a second perceptive horizon, though without limiting the view of the city. 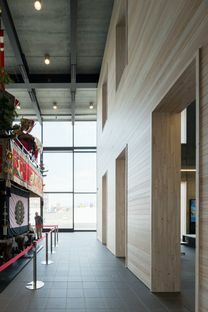 In functional terms, the building’s wooden heart contains shops, waiting areas and information desks on the ground floor, with civic spaces on the upper level to host events of various kinds. 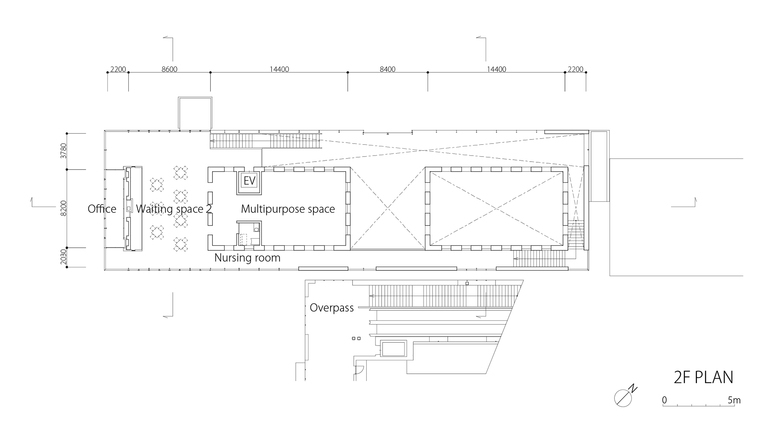 Outside is a veranda where citizens can stroll under a sheltering roof and enjoy the view of the city.